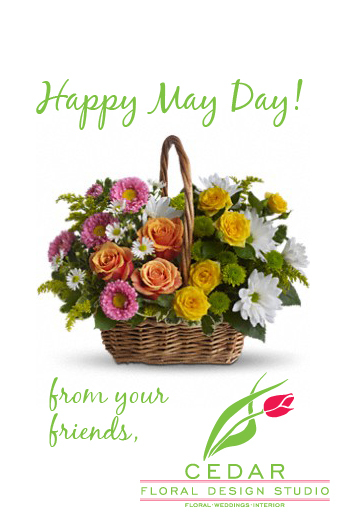 Did You Receive Your May Day Basket? May Day is today, the 1st of May and it comes around every year. I can remember as a kid, my lovely mom Candee would make little May Day baskets and we would take them to neighbors. We would ring their doorbell and smile and/or leave it on their doorstep. It was a strange little tradition, but always put a smile on people’s faces and my mom especially loved getting a little crafty with us kids. Well, welcome to 2012 and not only are little kids not suppose to ring door bells and run away or take candy from strangers, but who has the time to do this kind gesture? Today, I delivered 31,038 May Day Flower Baskets. The baskets were super cute with white daisies and bright Spring flowers to cheer up strangers, neighbors and friends. 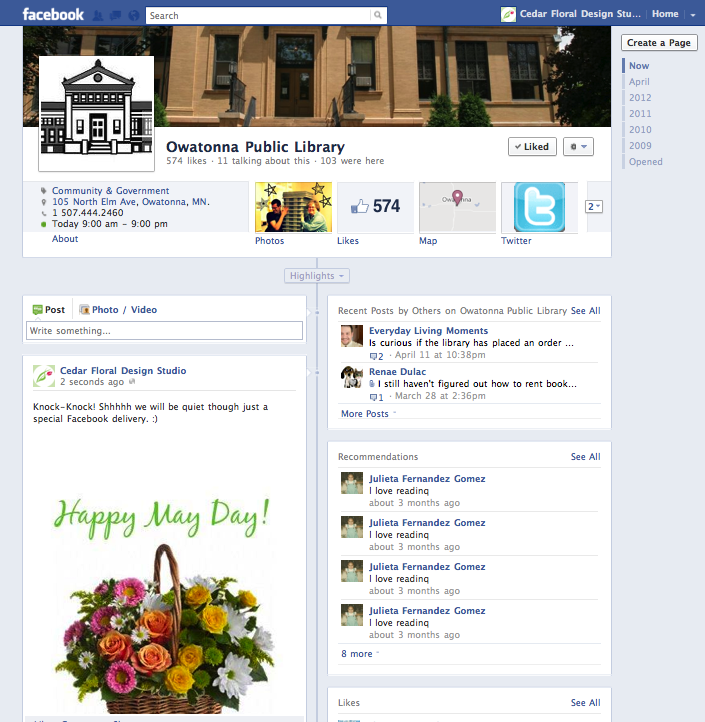 This cyber May Day basket concept came after talking with my mom about the May Day post for her work’s Facebook page. She reminded me to write something like “Hooray for May Day!” or “Happy May 1! 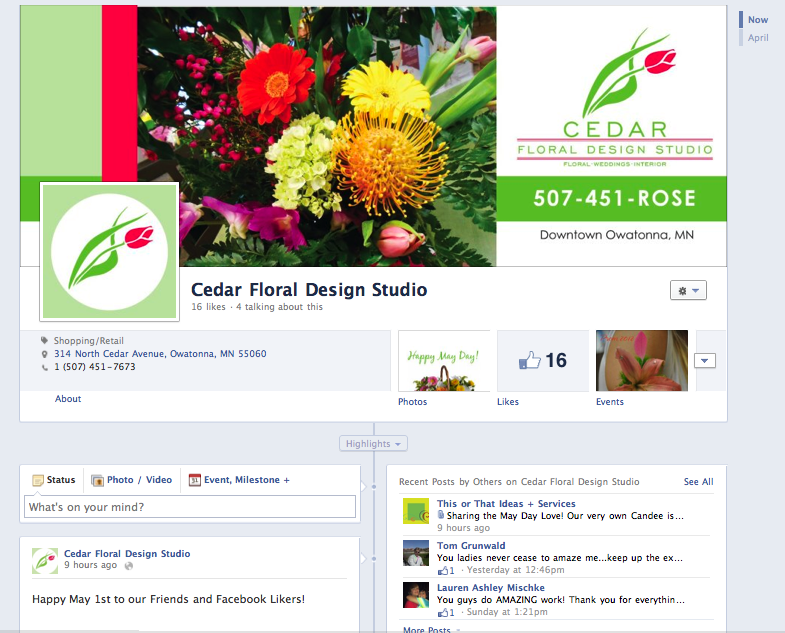 May Day is here!” I took that suggestion to the next level making a hands-on sharing opportunity to increase brand awareness for Cedar Floral Design Studio and increase their likes. The tricky part with posting a picture on someone’s wall as a Page is some have altered their settings so you can’t do so. Most cases the local businesses I wanted to deliver to had the front door wide open for me to ding-dong. 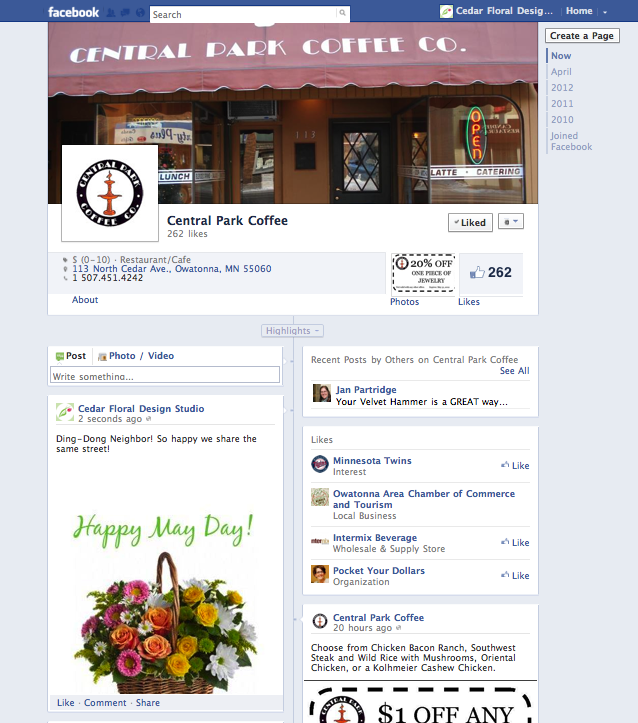 The most robust business was a company that had started in Owatonna with over 25,000+ Likes, Josten’s. This one may have a lot of likes, but the odds of having them do a shout-out like down the street business Hair-i-Tage with 603 Likes, is pretty low. Most of the page viewers may be night reviewers, but the page owners most likely would have been online during the day and not delivering at 10am may have effected the May Day activity slightly. 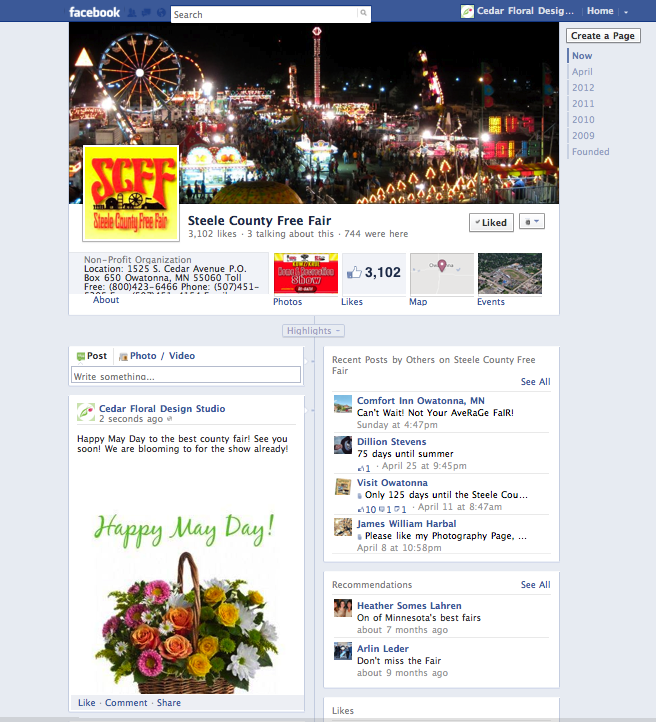 The design of the May Day basket was also taken into consideration. If you see the original that is pictured above you clearly see the “From Your Friends then the logo”, but some page owners but get scared with the branding so it is designed to look like a cheerful May basket without the branding. When someone clicks on it to see further though, they will see the logo and then also most importantly my tagging to the Cedar Floral Design Studio page itself. That is what is most important, is to get that user to go on my page and LIKE and possibly get engaged with my content. This idea is just one of the many that I have to execute in my social media designing career. Stay tuned for the summary on results later this week and also for more of this MN design gal’s social thinking. May you have a great rest of your May Day! This entry was posted in brand and/or product, good social and tagged Basket, Cedar Floral Design Studio, Facebook, flowers, Jostens, May Day, mndesigngal, tricia severson by mndesigngal. Bookmark the permalink.